This October 1953 assessment of contemporary Soviet music, by Nicolas Nabokov in the premiere issue of Encounter Magazine, is fascinating for three reasons. The first is that Encounter, which became a prestigious organ of the Anglo-American left, was covertly founded and funded by the CIA via the Congress for Cultural Freedom, itself a CIA front. The second is that Nabokov, a minor composer closely associated with Stravinsky, was the CCF music specialist. The third is that his article “No Cantatas for Stalin?” imparts blatant misinformation. And yet Nabokov was shrewd. charming, worldly, never obtuse. He was also laden by baggage of a kind that was bound to skew his every musical observation. Nabokov’s verdict came weeks before Evgeny Mravinsky premiered Shostakovich’s Symphony No. 10 with his peerless Leningrad Philharmonic. Some two years before that, Shostakovich completed a cycle of 24 Preludes and Fugues for solo piano. Neither work sustains a dominant tone of uplift. In fact, both are imperishable monuments to the complexity of the human spirit, arguably unsurpassed by any subsequent twentieth-century symphonic or keyboard composition. A cousin of the famous novelist, Nabokov was born in 1903 near Minsk to a family of landed gentry subsequently dispossessed by the Revolution. He wound up a US citizen in 1936. In 1949, he conspicuously humiliated Shostakovich at the “Peace Conference” at New York’s Waldorf Astoria Hotel – an adventure in Soviet cultural propaganda that provoked counter-measures; the CCF came one year later. It all came to an end when in 1966 Ramparts Magazine outed the CCF as a CIA operation. A firestorm of controversy and consternation erupted. Scores of prominent publications and writers suddenly discovered that they had in effect been secretly employed as American intelligence agents. The best-known book about the CCF – Frances Stonor Saunders’ The Cultural Cold War (1999) – impugns the CIA for compromising the intellectual freedoms it sought to promote. But the ironies of the campaign against Shostakovich elude her and other writers on the CCF. 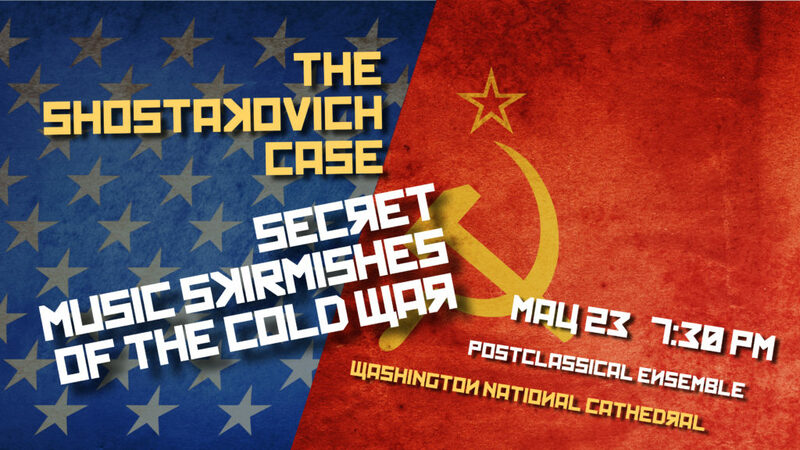 The penultimate event of the PostClassical Ensemble season at the Washington National Cathedral last week – “Secret Music Skirmishes of the Cold War: The Shostakovich Case” — attempted to make some sense of it all. We assembled a former US Ambassador to Russia, a former CIA staff historian, and Vladimir Feltsman, who as the most famous Soviet “refusenik” was beginning in 1979 notoriously banned from performing in public until escaping to the West in 1987. A formidable American pianist – Benjamin Pasternack — performed four Shostakovich Preludes and Fugues, as well as his still too little-known Second Piano Sonata of 1943. We also had an actor, Ashley Smith, delivering extracts from three of Kennedy’s culture-war speeches. The Kennedy orations made a great impression. Their sheer eloquence nearly masked their indefensible content. But Shostakovich’s Olympian D minor Prelude and Fugue — in which the legacy of the Well-Tempered Klavier is fused with the Slavic pathos and grandeur of Mussorgsky (a more “original” creative feat, I would say, then turning Schoenberg’s 12-tone method into a comprehensive compositional prescription)– silenced all debate. Pasternack’s riveting performance was amplified by the ambience of the Cathedral’s great nave. It sounded like this (use headphones and turn up the volume). At our National Cathedral event, both Nicolas Dujmovic, formerly of the CIA, and John Beyrle, a distinguished former US Ambassador to Russia and Bulgaria, defended the Congress for Cultural Freedom as an appropriate response to Russian disinformation. In fact, as even the Saunders book makes clear, the CCF was a sophisticated operation carried out by intellectuals on the left. One of the most fascinating episodes in her account is the CIA response to Joseph McCarthy’s loutish red-baiting, which the agency feared would undermine its nuanced propaganda efforts. And if Nabokov’s attacks on Shostakovich weren’t nuanced, if Kennedy’s speeches weren’t credible, the charged musical climate of opinion was such that nobody noticed. I would add one more irony to this complicated picture: the iron curtain. It paradoxically preserved musical traditions shattered or diffused in the West. Shostakovich’s Preludes and Fugues are an explicit homage to Bach. His symphonies build directly on the examples of Beethoven, Tchaikovsky, and Mahler. A fascinating new window on the contradictions of Soviet musical life is Marina Frolova Walker’s Stalin’s Music Prize (2016), which excavates previously inaccessible Soviet archives documenting how recipients of state musical honors were chosen. Ideologues promoting Socialist Realism did not always prevail over Shostakovich and other musicians of consequence for whom the ideals of a morally charged people’s art embedded in tradition were not merely cant. The de facto State Department expert on Soviet music, Nicolas Nabokov was in retrospect a music analyst deafened by the opinions, assumptions, and loyalties of a dispossessed expatriate who deemed Stravinsky’s neo-classicism a supreme affirmation of artistic and aesthetic “freedom.” His writings on this topic fed the risible claims of Kennedy’s Cold War cultural orations. What lessons, if any, can be extrapolated from this Shostakovich Case? Mainly, perhaps, that ideology and distance can greatly cripple our perceptions and assumptions. Is this finding, incriminating Cold War cultural propagandists on both sides, pertinent to the prosecution of the Cold War generally? To Cold War diplomacy as practiced under eight American Presidents? To our present-day understandings of Vladimir Putin’s Russia? Terrific piece that forces us to reconsider the Cold War cultural consensus. Again the Post Classical Ensemble unshackles the ear. 1) The 24 Preludes and Fugues are such great works, and yet one so seldom hears or sees anything about them. Your description of them as unsurpassed sounds hyperbolic, but it is true that they stand as a kind of monument that casts a telling light on postwar concepts of “new complexity.” And they provide an equal challenge to many of the doctrinaire superficialities of postmodernism. 2 The CCF is a national disgrace. It is beyond disgusting that the CIA still tries to justify such it. It will never be the business of decent governments to deceive and manipulate its citizens to socially engineer their cultural concepts. I’ve been talking and writing about the CCF for about 15 years, ever since I found Saunders’ book in a Paris bookshop. It is notable how the American arts world largely ignores the CCF and tries to downplay how it shaped the postwar arts world. 3) Our blanket condemnation of Social Realism and doctrinaire support of an apolitical high modernism skewed both our artistic and moral sensibilities. One thinks of the destruction our totalizing modernist thought wrought upon composers ranging from Copland to Barber to Bernstein. It undermined their world and the confidence and support they needed for creation. 4) Another example of how the iron curtain preserved musical cultures was how German orchestral styles and instruments were maintained in East Germany. 5) A full understanding of the era requires an analysis of the combined effects of the various programs that purged social thought from our society. HUAC, the CCF, the elimination of virtually all public arts funding, neoliberalism, the Truman Loyalty Acts, and the fanaticism of the anti-Rooseveltian ethos all combined to move America so far to the right than its stands far apart from the social democracies of Europe, the Commonwealth, and Japan. We became something of an extremist nation, and the consequences have been very destructive at home and abroad. The New Deal programs in the arts, many of which were astoundingly successful, stand as a marker that shows how radical this purging of American political and cultural thought was, and how much was lost through America’s move toward a radically unmitigated form of capitalism. Anyway, what a gratifying surprise to read your thoughts. And very interesting to think that built around these concepts was presented in Washington. In point 1 I said your comment sounds hyperbolic, but my sentence is unclear. The collection truly is monumental, even if it sounds hyperbolic to say so.